Of course C stands for Christmas, but as it is an ABC for Christmas and I have already covered Christmas in an earlier post, I will not repeat it here. There are many words with a C that can be linked with Christmas, but I have chosen for three that I think stand out. When you think of Christmas, you think of dark winter’s days (well if you live in the Northern Hemisphere that is) and the only way to lift your spirits is by putting some lights on. Candles are a great way to provide light in dark days. Although they are less bright than lamps, they provide more ambience and a little bit of warmth. 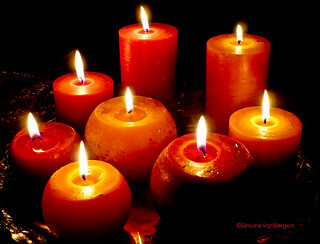 Candles have been around for nearly two millennia and have made some small changes since than. Back than most were made from (bees)wax or natural oils, whilst the majority of the modern candles are made of paraffin. On top of that modern candles come in all shape and sizes as well as colour and in some cases smells. Picking the right candle can greatly enhance the mood of an evening. Many people will have a dinner by candle light on Christmas. Which in itself is great, apart from when you want to make photos. Candle light can be tricky – it is a low level of light so to get the right image you might need to have more candles if you do not want to use your flash. Place the candles strategically on the table so they are not giving weird reflections on glassware or spectacles. I always think that candle light is great for photos as it makes people look softer and can give a great reflection in the eyes. As written in another post, Christmas time to use all your inspiration and imagination to create your own cards. Every year at Christmas I take a lot of photos of scenery, candles, trees and, if it is there, snow. When it comes to November the following year I have a great archive of photos to play with to create my own cards. Although there are many good cards around in the shops, I still think that your own made cards are that little bit special. As there are so many good printing facilities out there, you can create individual cards for everyone with having to pay a lot of money. The tradition of sending Christmas cards is only about 250 years ago although it did not really start to kick off until the 1900’s. Many Christmas markets and fairs will sell hand made cards, whilst in most high street shops you will find rows of commercially printed cards. Some of those will support charity, which have become quite popular over the recent years. Many business have started to use e-cards instead of physical paper cards to be reduce the impact on the environment. After all, most cards will only be placed in the house for about 2 weeks before many of them will be thrown away. Some people will keep cards so they can be used for next year to create your own. Like with the photography it is a great way to get a personalised message to your loved ones. It always amazes me how they harvest these little berries. Once fully grown and ripe, the plant beds are flooded in water. A harvester then drives through the bed to separate the berries from the vines. The berries float on the water, so can easily be driven together and collected. It is stunning to see! Most people will only eat these around Christmas time, but many health shops have dried versions available all year round. For both Thanksgiving and Christmas, cranberries are a near must to go with the turkey. Their sourness goes great with the dry smokey flavour of the turkey. Plus it is a feast for the eye as even after cooking they are still bright red.